Houston and his littermate, Austin, joined our family from Texas in July. 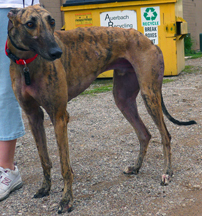 Austin is now in a forever home, leaving Houston as the ONLY hound from the Texas haul that does not have a family of his own. He did have two potential adoptions but they fell through. How can that be? Houston is currently in a foster home. He cannot have cats or small dogs as roommates, but he is the sweetest boy ever! UPDATE: Houston might have some greyt news... stay tuned!